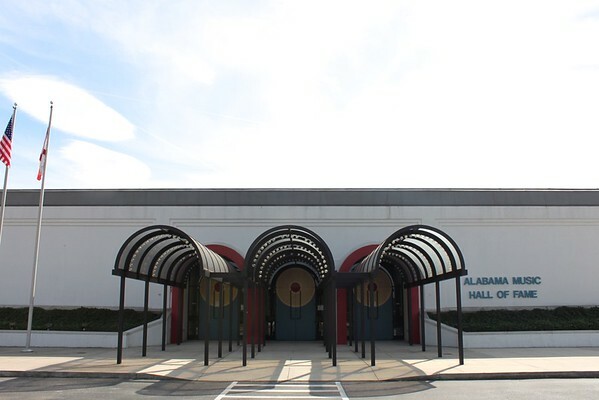 Set in the state’s most important musical region, the Alabama Music Hall of Fame documents significant musicians, writers, and producers that have come from here. 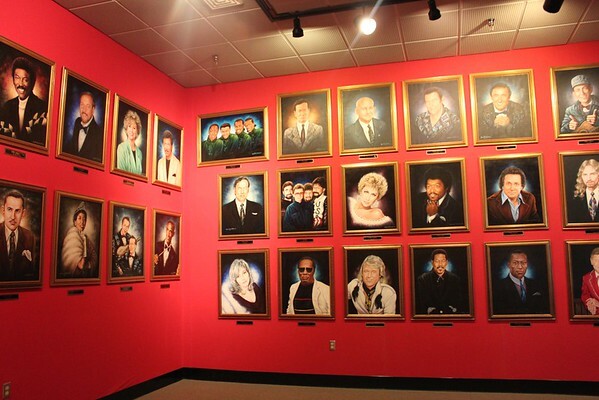 A walkway of bronze stars greets you as soon as you enter, showcasing just a few of the famous names to be inducted into the hall, called Alabama’s outstanding Music Achievers. The Temptations and Lionel Richie are just a few. The Hall of Fame Gallery lists all of the inductees from the founding of the organization to present. Tuskegee artist Ronald McDowell has painted each one. 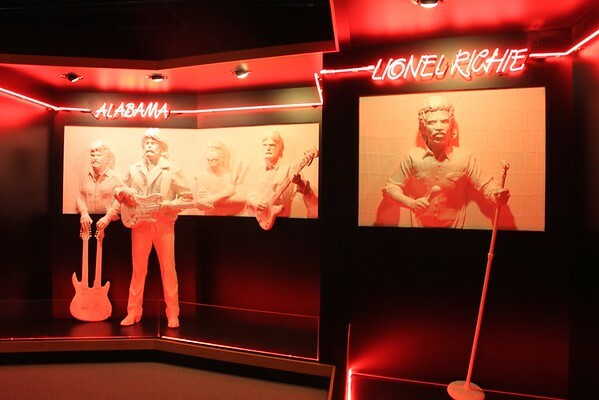 The next gallery, pictured below, has plaster casts of the band Alabama, Sonny James, Hank Williams Jr., and Lionel Richie. Once you enter the Popular Music section, a jukebox plays memorable hits from Alabama artists. Nat King Cole, Sam Philips, and Emmylou Harris are all honored here, along with their instruments and memorabilia. In the Country Music section, a massive guitar welcomes you to the memorabilia of names like Tammy Wynette, Hank Williams, Sonny James, and Rose Maddox. The “Golden Country Car” is a unique fixture in this hall, a 1960 Pontiac convertible with 500 silver dollars and 12 silver guns mounted around the car with a Texas longhorn antler on the front. There’s even one of Alabama’s tour buses inside, just as it would have been when the group was on the road. The Rhythm and Blues section honors W.C. Handy, Wison Pickett, and Erskine Hawkins, while the Muscle Shoals section brings the area’s music history back into focus. A video tribute showcases some of the songs recorded in the nearby studios. A recording studio allows visitors to record their own single as a part of their experience. There’s also the Gospel Showcase and songwriters section. Give yourself a few hours to wander this museum. Alabama Music Hall of Fame is located at 617 Highway 72 West in Tuscumbia, Alabama 35674. Parking is free. Admission is $10 for adults, $8 for students and seniors, and $7 for children under 12. They’re open Tuesday to Saturday from 9 am to 5 pm. 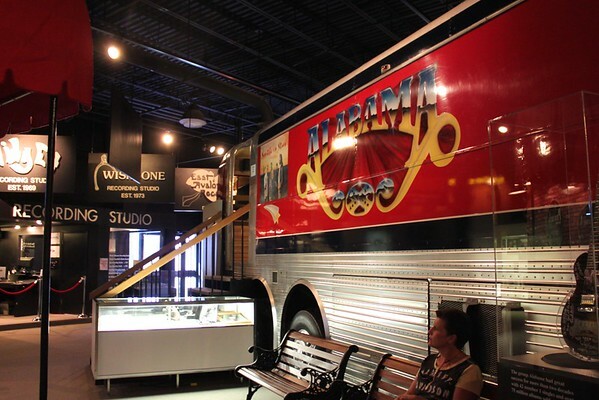 Visit Florence Alabama hosted my trip to the Alabama Music Hall of Fame.